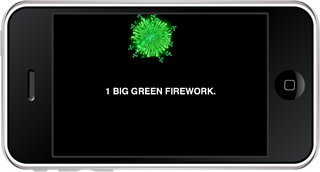 Fireworks 123 is a FREE interactive â€œcause and effectâ€ app ( available at iTunes ) that is designed to support the development of early literacy skills and the comprehension of descriptive concepts such as number, size, and color in a fun and entertaining way. 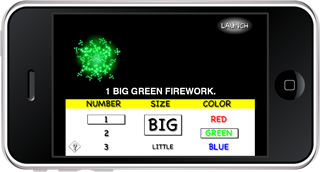 a user makes a selection from one of the three descriptive choice menus, Fireworks 123 provides immediate feedback by showing a clear visual representation of the choice made. a firework show to watch a fun and dynamic visual display designed to further reinforce comprehension. Copyright ©2016 · Visuals Work. All Rights Reserved.